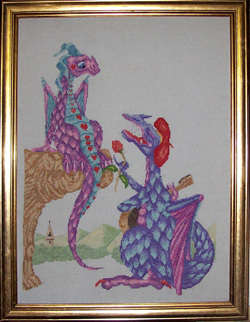 Dragon cross stitch designs stand the test of time. They seem to be ever popular. The two humorous designs below were great fun to design and stitch, and I hope you will enjoy them too. These dragons can be purchased and downloaded onto your computer in minutes. No waiting for the mail to arrive, and no postage costs! Design size 17.5" by 22" approx. I wonder what these two friends are up to? 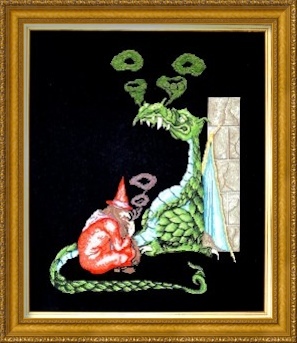 The dragon and wizard sitting by the castle wall are worked in cross stitch. The smoke rings are worked in half cross stitch (just the bottom leg on the stitch, nothing complicated) to give a transparent effect. Blending filament in blue and green are used on the dragon's scales. This cross stitch dragon is stunning stitched on black fabric but also works well on white or cream. These two dragons do not believe it!. The model is stitch on silver grey Jobelan.